With the wicket of Somerville, Yasir completed 200 wickets in only 33 Test matches. 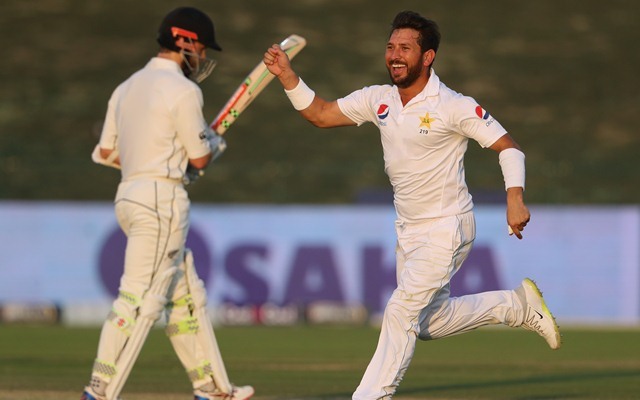 Yasir Shah stepped up for Pakistan who were in need of his exploits after a shocking collapse that led to a 4-run defeat in the first of the three-match Test series against New Zealand. Yasir ran through the Kiwi’s batting in the first innings of the second Test in Dubai as the visiting side were reduced to 90/10 from 50/0. The leg-spinner finished with his career-best figures of 8/41 and took six more in the second innings. With this effort, Yasir became only the 2nd Pakistan bowler to claim 14 wickets in a Test match. Ten of those wickets came on 3rd day itself making him the first Pakistan player with ten Test wickets in a single day’s play. In the opening session of the series-deciding Test in Abu Dhabi, Yasir picked up three wickets to extend his Test career wickets to 198. The leggie couldn’t add any more wickets in the first innings but dismissed Tom Latham and Will Somerville in the second innings to leave them reeling at 37/3. With the wicket of Somerville, Yasir completed 200 wickets in only 33 Test matches. Yasir Shah, thus, became the quickest player to complete 200 wickets in Test history. He broke the record held by another leg-spinner Clarrie Grimmett who reached the milestone in only 36 Tests. The Australian was the first of the 73 players to claim 200 wickets in the longer format. None of the 71 players between Grimmett and Shah with 200 Test wickets failed to rewrite the record. The closest was Ravichandran Ashwin as the Indian off-spinner needed 37 Tests for the milestone. 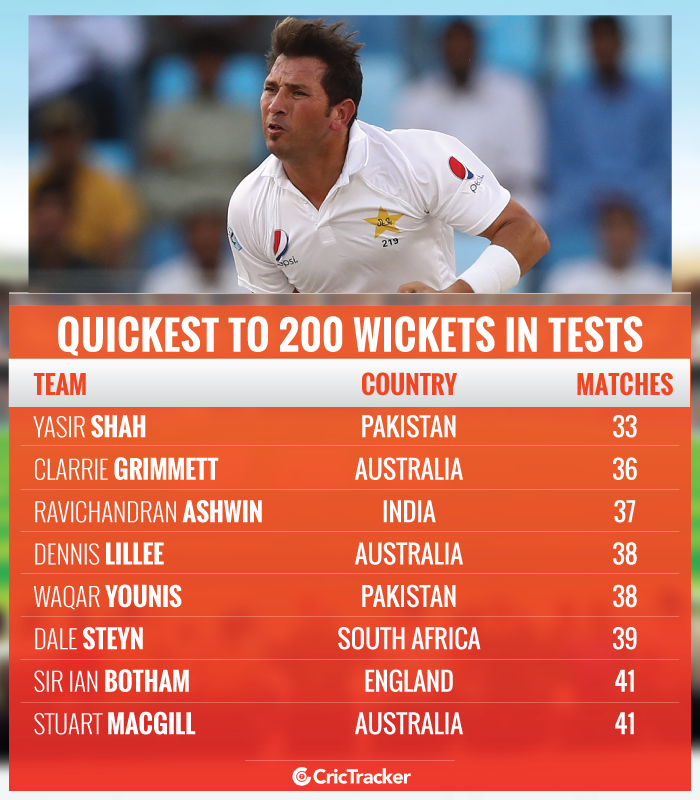 Overall, only six players including Yasir have completed 200 Test wickets in less than 40 Test matches. The previous fastest to the milestone among Pakistan players was Waqar Younis who needed 38 Test matches. Yasir Shah is also the joint 2nd fastest to 100 and 150 wickets in Test cricket taking 17 and 27 matches respectively. He is also the fastest to 50 Test wickets for Pakistan which he achieved in his 9th Test only.